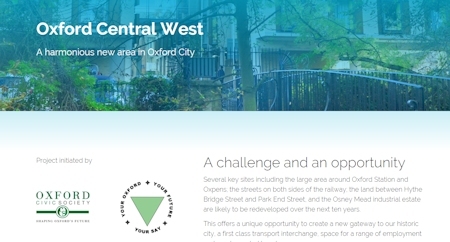 Our article “Oxford Central West” describes a Workshop Oxford Civic Society is organising to discuss the redevelopment of several key sites in the western part of the city in the next ten years. In the month leading up to the Workshop the Society is trialling a new way of finding out what people think about the area now and in the future. We are working with a company called Commonplace who specialise in running online consultations. They have worked with many city and borough councils, neighbourhood forums and the like, but this will be the first time their approach has been used in Oxford. We have set up a dedicated website where anyone can put a marker on a map of the area and tell us what they think about that place or the wider area. It is easy to use and it works just as well on smart phones and tablets as on a desktop or laptop. You can register with facebook, twitter or your email address, and once you have registered, which only takes a few moments, you can go back as many times as you like and leave your comments. The software lets us easily analyse the information. We will present the results to the Workshop before the detailed discussions start so that the delegates have some real and up to date information about people’s views. We will be publicising this as widely as possible with the slogan ‘YOUR OXFORD – YOUR FUTURE – YOUR SAY’. You can go straight to the website to leave your comments using this link.